* Model S built before 23-Dec-2014 with UHFS, had XM radio without the Pano roof, as the antenna was mounted behind the top of the rear hatch glass. This location causes a few more dropouts than the later designed roof mount. Between 23-Dec-2014 and mid-2018, the pano roof was required along with UHFS to get XM. In mid-2018 XM is included in all cars, no matter the roof type. None from Tesla. In general, it is not possible to add the Tesla XM radio later if it was not factory installed. Even if you purchased the parts and your found a suitable location for the antenna, Tesla is not likely to turn access to Tesla’s XM software to control it. When XM is not available in your car, there are a few options that may work as an alternative. Use an aftermarket XM receiver that is installed in your vehicle. Purchase one that includes a FM modulator to transmit the stereo audio to the vehicle. 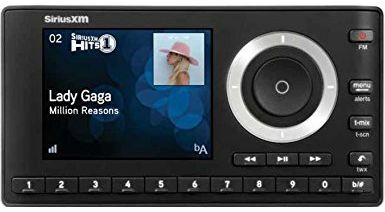 For example, the Onyx Plus Satellite Radio Receiver with car kit is available from Amazon for $66. XM offers a streaming service that you can receive via your cell phone and send the audio to your car via Bluetooth. This does require cellular reception and uses your cellular data plan. Use Slacker that is built into the vehicle. Slacker offers higher quality audio, but it is limited to the in-car cellular connection. Some channels are unique to XM and cannot be found on Slacker, but there may be suitable alternatives in some cases. Use an alternative streaming service via your phone. Like XM streaming, it does require a cellular reception and uses your cellular data plan. FM radio may also provide a suitable alternative for some. For music, you can load a USB stick with your music and play even when there is no satellite or cellular reception. Often bundled in an expensive options package. The Model S/X used to require buying the $5,000 Premium upgrades to get XM, but now included in all new S/X vehicles. Like phone and cable companies, you’ll get the best deal if you cancel, and wait for a new offer. The next best is to call and threaten to cancel, where they usually often offer a smaller discount to stay on-board. Repeat every time the price is jacked up.